Lottery operator Halifax Ltd. has today launched a one-of-its kind SMS-based lottery that will allow Kenyan mobile phone users to buy lottery tickets using SMS messages. The entire process from purchase of lottery ticket to the redemption of prize money will be on mobile platforms. The Lottery campaign is the first ever end-to-end SMS-based lottery run in the country. Kenyans using any of the three mobile service providers- Orange Telkom Kenya, Safaricom and Airtel Kenya are all eligible to participate in the lottery. Speaking at a media briefing this morning, Bingwa Lottery Executive Chairman, Dr. Solomon Lenengwesi, said that the Lottery will give Kenyans a unique opportunity to participate and they stand a chance to win millions. “We are pleased to be part of this first ever end-to-end SMS based lottery enabling anyone with a mobile device to participate in the lottery. Our customers will be able to take part in the lottery by sending an SMS using the short code 22299 on their mobile phones. The partnership comes at a time where mobile technology has transformed our lives by becoming a platform for more than just basic communication at the touch of a button. Orange also remains committed to giving our customers quality and value for their money”, says Vincent Lobry, the Orange Telkom Kenya CEO. A surprise jackpot will be given with the actual amount to be revealed on the 3rd week of April. The prize structure is such that in addition to the jackpot, substantial amounts will be spread to other participants who will win secondary prizes. 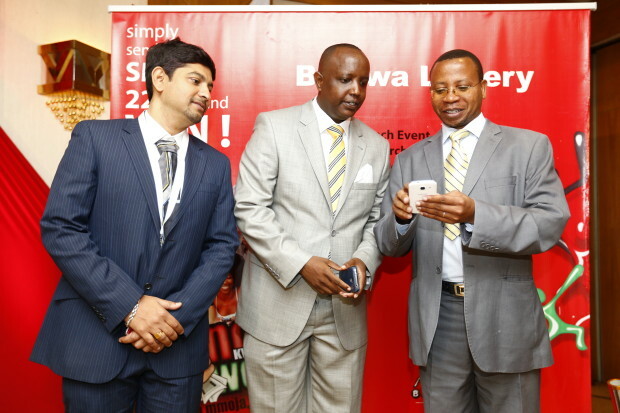 25percent of the gross revenue from the Bingwa Lottery will go to charity. Televised draws for the new lottery will take place at 9:00pm, every Sunday night under the vigilant supervision of Betting Control and Licensing Board (BCLB) officials. The first draw will take place on 26th April, 2015, one month after the launch.